Quickly put together this simple chocolate treat that only takes 3 ingredients! Just as easy? 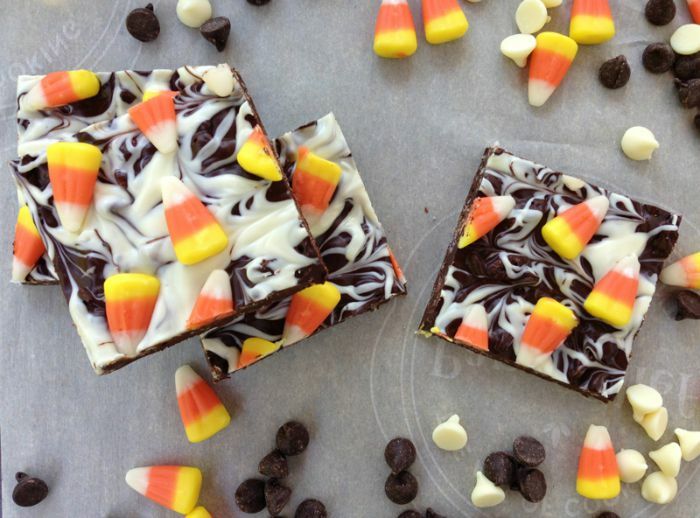 Enjoying this Candy Corn Bark Recipe! Melt the chocolate in the microwave on medium heat. Add the Rice Krispies and candy corn to the chocolate and stir. Spread evenly onto a non-stick cookie sheet. Top with remaining candy corn. Let it cool completely and break up into chunks to serve. To make fancy swirls in the bark if desired, melt the white chocolate. Drizzle white chocolate over the mixture using a spoon. Then lightly pull a toothpick through the top to create the swirls. Find 20+ more Candy Corn Recipe Fun, Crafts and Creativity for the whole family. Shipping is FREE with Amazon Prime or $35+ orders. Sign up for a FREE 30-Day Amazon Prime Trial HERE. Along with FREE shipping you will get access to thousands of movies, tv shows, books and music for FREE! Inspired by this candy corn recipe. To make fancy swirls in the bark if desired, melt the white chocolate, drizzle white chocolate over the mixture using a spoon. Then lightly pull a toothpick through the top to create the swirls. So cute and easy, love it! These look delightful! These would be perfect for our Halloween party this year!!! I will have to try this! 🙂 Looks good and tasty for fall. Thanks for sharing. Candy corn has got to be one of my guilty pleasures. I hate it because once I start eating them I can’t stop. BUT THEY ARE SO GOOD!!! Great recipe! OH I love this!! I am a Candy Corn freak. I am featuring this post at the Wonderful Wednesday Blog Hop this week. Thanks for sharing this. I love how easy this is to make. Thanks for sharing at the Inspiration Spotlight Party. Pinned & shared. These look perfectly beautiful and delicious! Love these treats. I must admit I have a thing for candy corn. Have to make these. Lovely Halloween treats. Thank you for bringing this to Fiesta Friday!